The Cóiste Bodhar (pronounced coach-a-bower) in Irish folklore is a silent death coach that makes its appearance in the event of someone’s death. Its driven by the Dullahan, the headless horseman and pulled by four black horses. There are various descriptions of the Cóiste Bodhar, like how its pulled by 6 headless horses and not four or how it carries a coffin mounted on the back. It is safe to say though, the Cóiste Bodharbut is driven by the Dullahan and a death will occur. Summoned by the wails of the Irish Banshee the Cóiste Bodhar will rumble through the streets of villages and where it stops is an omen of death. The coach must return with at least one soul on-board that soul cannot escape its final destination. Irish people believed that if the Cóiste Bodhar is approaching then gated roads should be opened to allow the coach to pass onto somewhere else. People were afraid to witness the death coach as it could mean imminent death for whomever sees’ it or the death of a loved one. It was also believed that if you open your door to the Cóiste Bodhar a basin of blood will be thrown in your face, as mentioned in Folk tales of Ireland by W. B. Yeats. There are many folklore stories in Ireland surrounding the Cóiste Bodhar with people hearing the rumble of its wheels in the darkness of the night along with the distant wailing of the banshee. 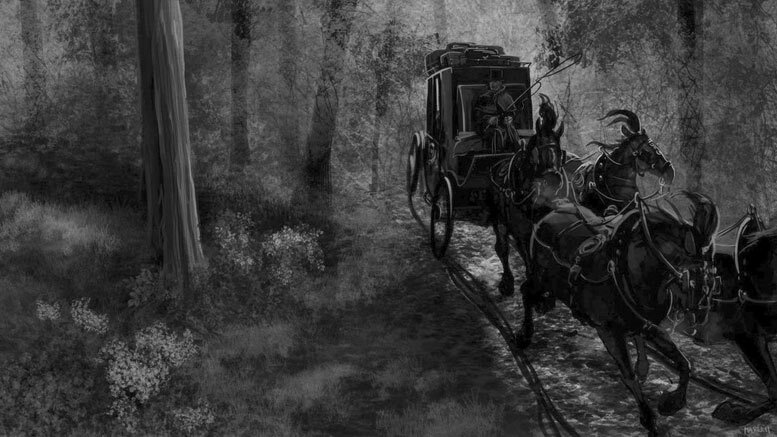 One popular folklore story in Ireland of the coach-a-bower dates back to 1806. As a sick man lay on his bed dying his children sent for the doctor and sat on the outside steps waiting for his arrival. After a while they heard the distant noise of a coach with its rumbling wheels getting closer and closer when suddenly a large dark coach entered the court yard. The two older children, both young men, walked down the steps to greet the doctor but to their surprise the coach didn’t stop. It continued down an avenue, passed between a fence and hedges towards a closed a gate. The two young men ran to the gate but were surprised to find it locked and that the coach had vanished without a trace. Not realising what had just happened they woke the lodge-keeper to check the whereabouts of the gate keys only to find them tucked safely under lodge-keepers pillow. A short time after the mysterious disappearance the doctor arrived at the house, unfortunately it was too late and the sick man passed away a few hours later. Another popular story occurred on December 11th 1876 a servant for the MacNamara family of Ennistymon House in county Clare was taking a late night stroll when he heard the rumbling of wheels. Thinking to himself what vehicle would be out at such a late hour he suddenly realised it was the Cóiste Bodhar. Without hesitation the servant dashed and opened the 3 gates leading to Ennistymon House and threw himself face down on the ground and the death coach whizzed past him. It didn’t stop at Ennistymon House but drove into the distance until it was out of sight and no longer heard. A day later Sir Burton MacNamara died in London. Do Irish people still believe in the Cóiste Bodhar? Its probably safe to say that if any Irish person believes in the Cóiste Bodhar then they are very few in number, there was a time though it was widely believed in Ireland. Today though many stories of the Cóiste Bodhar are still being told and taught to kids so it still remains a popular part of Irish folklore. Most Irish adults will probably remember being told stories of the Cóiste Bodhar and how it gave them nightmares at bed time so its not something they will easily forget. Last updated January 13, 2019. Dave has a passion for anything relating to Ireland.